Delicious and addictive keto party mix! 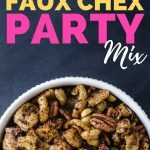 If you’ve been wishing Chex Party Mix had no carbs, you have to make this low carb party mix recipe. I love, love, love Chex Party Mix but unfortunately, my blood sugar doesn’t. 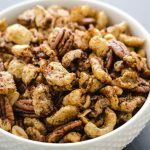 I created this low carb party mix recipe for all of you who miss it as much as I do. 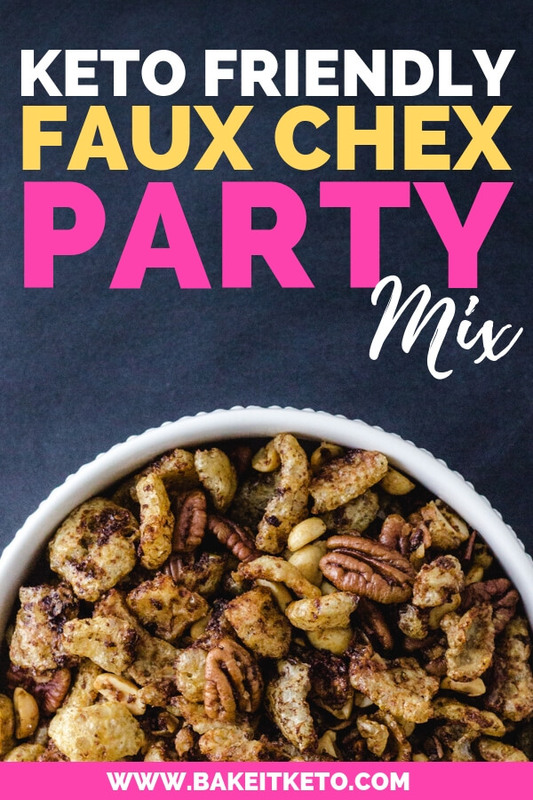 My keto friendly version of Chex Mix is great for parties, just like the original. It’s also a fantastic low carb snack because it’s super easy to take along to work, on a road trip, or wherever you’re headed. I really wanted to replicate the delicious cereal crunchiness in this low carb recipe, so I used Epic Himalayan Sea Salt Oven Baked Pork Rinds (my favorite!). You can break the larger ones up a bit with a few whacks of a rolling pin so they will be Chex size. The rest of the recipe is sooo easy. Just combine the pork rinds, your choice of mixed nuts, and unsweetened flaked coconut (I only buy this kind) in a big bowl with room for mixing. The coconut really soaks up the extra sauce and grabs on to the pork rinds and nuts for an extra burst of flavor. All you need for the sauce is some melted butter, gluten-free Worcestershire sauce, garlic, onion powder, salt, and granulated swerve. Whisk it all together, pour it over the pork rind mixture, and mix until every piece is coated by the delicious party mix sauce! Traditionally, Chex Party Mix is cooked in the microwave. Umm, no thanks! We want to get some flavorful browning going on, especially on the nuts. So this recipe is baked in a very low oven for about an hour. Make sure to stir the party mix every 15-20 minutes, and feel free to adjust the cooking time if you like it a little more or less done than I do. Let the finished party mix cool and then store it in an airtight container. Or make these Maple Rosemary Cocktail Nuts created by Carolyn Ketchum for A Sweet Life. And if you don’t have any time to cook, buy this Moon Cheese Variety Pack. It has five flavors and it even includes the Sriracha flavor! 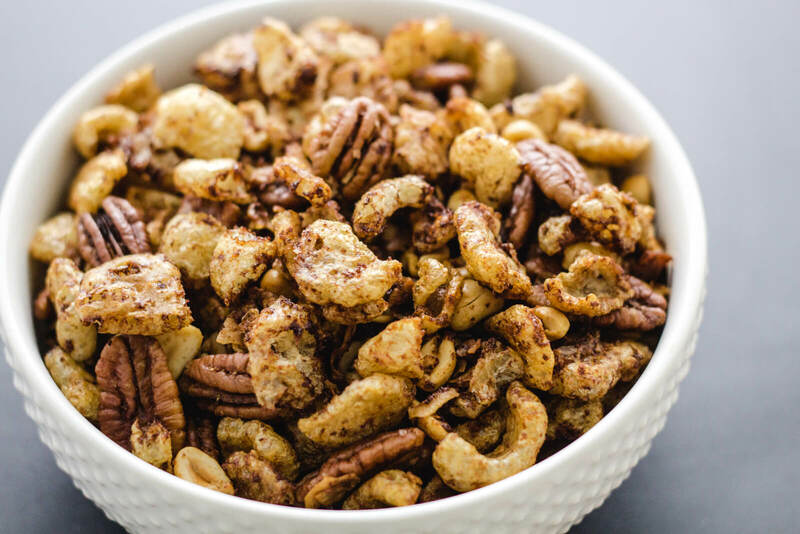 Combine the Pork rinds, mixed nuts, and unsweetened flaked coconut in a large bowl. In a small bowl, combine the melted butter, Worcestershire sauce, garlic, onion powder, Swerve, and salt and whisk to combine. Pour the butter mixture over the pork rind mixture and toss to coat each piece. Spread the keto party mix evenly on a sheet pan lined with parchment paper. Bake at 250 degrees F for 1 hour, stirring 3-4 times. 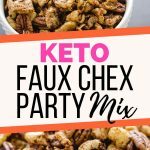 WANT TO SAVE LOW CARB KETO FAUX CHEX PARTY MIX FOR LATER? CLICK HERE TO PIN IT TO YOUR FAVORITE KETO PINTEREST BOARD!